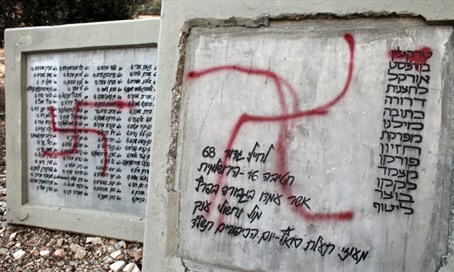 Holocaust memorial monument desecrated, smashed on anniversary of Adolf Hitler's birthday, in apparent neo-Nazi attack. Unidentified persons vandalized a Holocaust monument in Lithuania on the anniversary of Nazi leader Adolf Hitler’s birthday. The monument in Vilkaviskis, a city located 90 miles west of the capital Vilnius, was stripped of its marble tiles and smashed in several parts on April 20, according to a report posted seven days later on the Facebook page of the city’s tiny Jewish community. Lithuanian police have been informed of the incident and are investigating. The unfenced monument was vandalized once before in 2012, prompting police to arrest a suspect based on eye-witnesses’ accounts, the news website suduvis.lt reported last year. However, police have not arrested any of the thieves who regularly strip marble tiles off the monument. On the eve of World War II there were 3,600 Jews in Vilkaviskis, comprising approximately 40 percent of the total population, according to Israel’s Yad Vashem Holocaust museum. The German army occupied Vilkaviskis on June 22, 1941, destroying many Jewish homes and its synagogue amid pogroms by Lithuanian nationalists. Jews were imprisoned in a ghetto set up in a military barracks outside of town and murdered systematically beginning on July 28, 1941, when the ghetto’s men were shot by Nazis and locals, and dumped in pre-dug pits. The women and children were shot and buried at the same place two months later. The Red Army liberated Vilkaviskis in the summer of 1944.